Millions of people visit Florida every year, with the state drawing in huge crowds of tourists from all four corners of the globe with its world class theme park attractions like the Magic Kingdom and Epcot at Walt Disney World Resort or Universal Studios and Islands of Adventure. These parks, which are all centered around the Orlando area, provide incredible fun for all the family, but there's much more to the Sunshine State than rollercoasters and Disney princesses. The state is also home to some beautiful beaches and historic coastal cities, with Tampa standing out as a key example. Located in Hillsborough County on the western coast of the state, Tampa is the biggest city in the surrounding Tampa Bay area. It's located in close proximity to many of Florida's very best beaches and is the second biggest metropolitan area in all of FL. Tampa even has its own theme park in the form of Busch Gardens and has a lot of other great attractions and points of interest too like the Ybor City historic neighborhood, the Henry B. Plant Museum, the Raymond James 'Ray Jay' Stadium, towering skyscrapers, the Tampa Riverwalk, and so much more. If you're planning a trip to Tampa and want to know the best way to get around while appreciating the beauty and history of this incredible city, look no further than the Tampa trolley system. Officially known as the TECO Line Streetcar System, the Tampa trolleys are a great way to get around, and the best part of all is that a ride on this Tampa trolley is totally free at any time of year! So, on your next visit to the Tampa Bay area, be sure to visit Downtown Tampa and hitch a ride on board the Tampa trolleys. If you're looking to ride the Tampa trolleys, it pays to know some important information before you set out on your journey. Firstly, it's important to note that the Tampa trolleys operate under the name 'TECO Line Streetcar System'. This trolley system first opened up back in October of 2002 and runs for 2.7 miles on a single line. 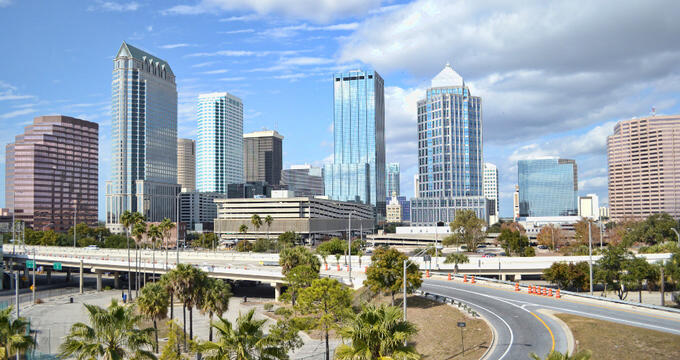 It calls at a total of 11 stations all around the city of Tampa and connects some of the key areas together, offering easy access to many of Tampa's top locations and landmarks. There are 11 streetcars used on the line at any one time. 10 of them are replicas, and one is actually an authentic historic trolley that has been restored. Tampa has quite a long history with trolleys and streetcars, stretching back all the way to the late 19th century, but the original Tampa trolleys were removed from service in the wake of World War II. Then, in 2002, the Tampa trolley system made its overdue comeback and has been a beloved part of the city ever since. For a long time, the Tampa trolleys charged fares for passengers, with discounted rates available for those who lived in the local area and along the trolley route. However, from October 2018, the TECO Line Streetcar has been fully free for all due to grant funding provided by the Florida Department of Transportation. This free service is set to continue for the coming years and ensures that the Tampa trolley is one of the best ways to get around the city. The Tampa trolley system runs along one route and calls at 11 individual stops. It travels through the Downtown area, the Channel District (also known as Channelside), and the historic Ybor City district. Five of the stops are situated in Channelside, four in Ybor City, and the remaining two in the downtown area. As part of the recent upgrades to the service due to funding provided by the FDOT, the Tampa trolley is now running on an extended hours schedule. It operates from 7 am to 11 pm on Mondays throug hto Thursdays and from 7 am to 2 am on Fridays. On Saturdays, the Tampa trolley service runs from 8.30 am through to 2 am, and on Sundays it runs from 8.30 am to 11 pm. The operating hours for the Tampa trolley system are usually extended for sporting events like Tampa Bay Lightning games at Amalie Arena and other big events. In general, Tampa trolleys run every 20 minutes, but the service runs even faster from 7 am to 7 pm on weekdays, with trolleys arriving at each stop every 15 minutes.